The leading source of Teenage Mutant Ninja Turtles (TMNT) news and information on the Web. Includes TV, movie, comics, and toy news. Hey, TMNT fans! Come see me this weekend at 2017 Tracy Comic Show! I will have an artist table with original paintings and prints. AND! Kevin Eastman (Sat. only), Ernie Reyes Jr., and Mark Bode will also be there with Turtle goodness. It should be a good time, and it's all for charity! Just a day after announcing the new principal voice actors in next year's new "Rise of the TMNT" series, Nickelodeon has released a short video with clips of the new cast. If you pay attention, you can also see Rob Paulsen in the director's booth, doing his new directing thing! "Rise of the Teenage Mutant Ninja Turtles" stars Kat Graham as April O’Neil, Josh Brener as Donatello, Omar Miller as Raphael, Brandon Mychal Smith as Michelangelo, Ben Schwartz as Leonardo, and is expected to premiere in Fall 2018. With an article published by The Hollywood Reporter this morning, we now know the core voice cast of next year's "Rise of the TMNT" series, as well as a few more details about the show. 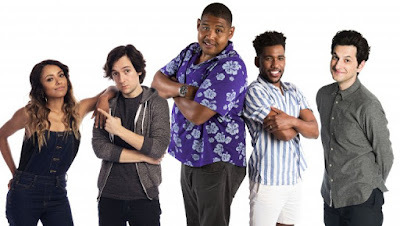 From left to right, Kat Graham is April O’Neil, Josh Brener is Donatello, Omar Miller is Raphael, Brandon Mychal Smith is Michelangelo and Ben Schwartz is Leonardo. Additional talent in the cast includes Eric Bauza as Splinter, and Omar Miller and Ben Schwartz in unnamed roles. While April, Donatello, and Michelangelo are described familiarly to how we've seen them before, an interesting detail from the article is the statement that "Raphael, the oldest and physically biggest brother ... is now the Turtles' leader" and "Leonardo [is] the self-professed "coolest" brother." We can expect to see 26 episodes of "Rise of the TMNT," which is described as a "reimagining that follows the band of brothers as they encounter new allies and villains and discover a mystical world they never knew existed beneath the streets of New York City." Chris Viscardi, senior vp production and development, animation, at Nickelodeon, adds, "We have reimagined the series to be filled with humor, loads of action and a dynamic look, and it's packed with all-new heroes, villains and cityscapes for the Turtles to explore." One really neat detail provided is that Rob Paulsen, previously Raphael in the original cartoon and Donatello in the 2012 Nickelodeon series, will be directing this new series. "Rise of the TMNT" is co-executive produced by Andy Suriano (character designer, Samurai Jack) and Ant Ward (supervising producer, Teenage Mutant Ninja Turtles).